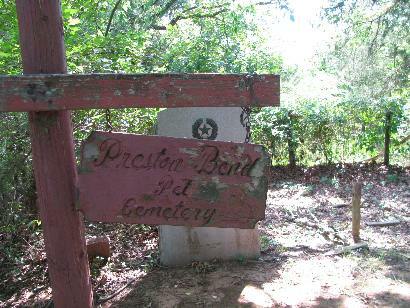 Preston grew near present-day Pottsboro, Texas on a bluff of the Red River. 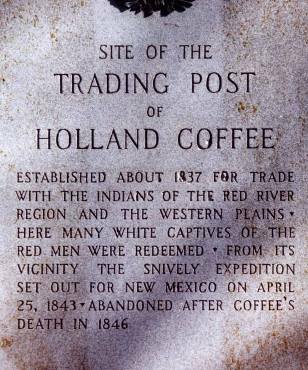 Originally a trading post established by Holland Coffee and Silas Colville, the town was such a violent place that Coffee was murdered there in 1846. Also known as Preston Bend, despite its location on a bluff, the town was a major crossing on the Red River with a reported 1,000 wagons crossing there in a single year. The town was the end of the Indian Nation's Texas Road and there was a heavy traffic in liquor. Two early ferries were in operation around 1850. The town formed its own government in 1851. For its first two years the town was the location of an Army depot and except for the violent element, the town seemed destined for growth. 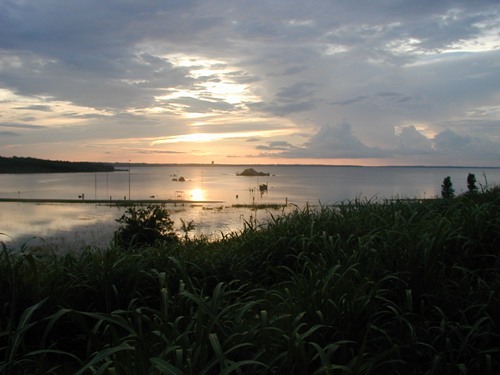 But rival towns grew stronger faster and the main crossing of the river shifted to Colbert’s Ferry, eclipsing Preston. Old Preston was nearly forgotten by 1870, and a newer Preston developed a short distance away. The “New” Preston didn’t fully develop as a town, but did serve as the center of a scattered community. With two churches, a school, cotton gin and post office (granted in 1880, closed by 1914) Preston remained in place while the site of Old Preston was purchased in the late 1930s for the construction of Texoma Dam (completed 1944). 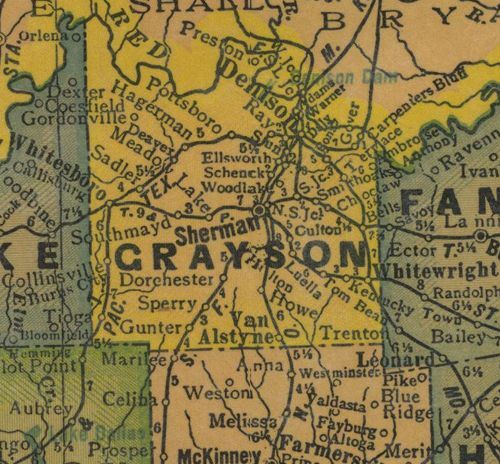 The population of “New” Preston was 325 residents for the 2000 census. Established about 1837 for trade with the Indians of the Red River region and the western plains. Here many white captives of the Red Men were redeemed. From its vicinity the Snively Expedition set out for New Mexico on April 25, 1843. Abandoned after Coffee's death in 1846. 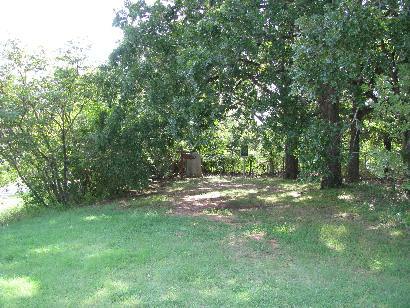 Settled 1839 at Glen Eden, a site now under Lake Texoma, north of here. 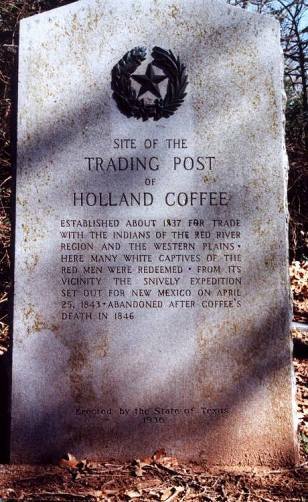 Husband, Holland Coffee, early trader, built fine home, welcomed 1845-60, U. S. Army officers including Robert E. Lee and Ulysses S. Grant. During Civil War, wined and dined passing Federal scouts, found out they were seeking Col. Jas. 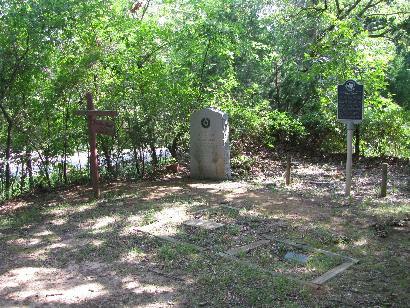 Bourland, Confederate defender of Texas frontier. 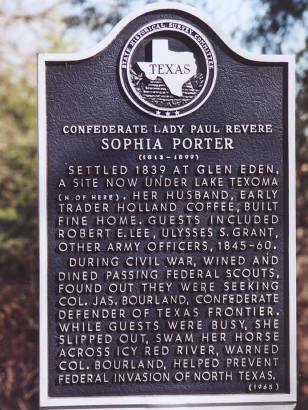 While guests were busy, she slipped out, swam her horse across icy Red River, warned Col. Bourland, helped prevent Federal invasion of North Texas.